250 levels of Arkanoid-style breakout. Is there a better alternative to Acky's XP Breakout? Is Acky's XP Breakout really the best app in Arcade category? Will Acky's XP Breakout work good on macOS 10.13.4? 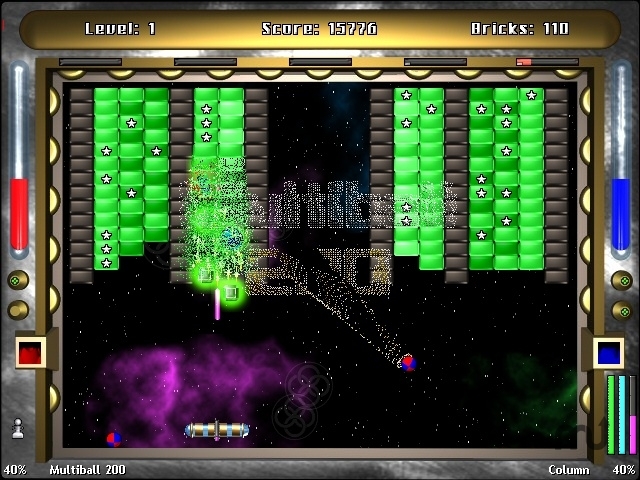 Acky's XP Breakout is a game where you blast your way through 250 powerful levels in the ultimate arkanoid game. Discover unique power items, brick types, and fun in Acky's XP Breakout. The gameplay is always changing with a dynamic mesh of particle effects, point bonuses, and object morphing to keep you mesmerized. Enjoy enhanced gameplay with XP Mode and customize the game to your own personal liking with many options. Enjoy improving your reflexes and eye-hand coordination. Acky's XP Breakout needs a review. Be the first to review this app and get the discussion started! Acky's XP Breakout needs a rating. Be the first to rate this app and get the discussion started!